Synapse maintains EPA’s Avoided Emissions and Generation Tool (AVERT) model, a publicly-available tool designed to estimate the emissions displaced at electric power plants by incremental additions of energy efficiency and/or renewable energy. Recently, Synapse worked with EPA to implement several upgrades to the AVERT framework, including incorporation of particulate matter (PM2.5) into the tool and several algorithmic improvements. In addition, the release of the 2016 data year means that a full decade of AVERT data is now publicly available. In celebration of these milestones, we dove into AVERT’s dataset to examine how dispatch of the fossil fleet has changed over the past decade. Our analysis examined dispatch of the fossil fleet by region and unit fuel type (coal, natural gas, or oil). The results confirm the widespread understanding across the electric industry that coal-fired generation is increasingly marginal. Our analysis examined the impact of a 5 percent decrease in fossil load due to incremental additions of energy efficiency. Energy efficiency programs reduce effective customer demand for electricity which, in turn, reduces the level of generation needed during some or all hours. We can estimate the impact of different energy efficiency programs by quantifying avoided generation and emissions from “marginal” units. Marginal units are generally the most expensive generators online at any given hour. Marginal units are chosen last to meet peak demand, and they are the first generators impacted by energy efficiency programs. 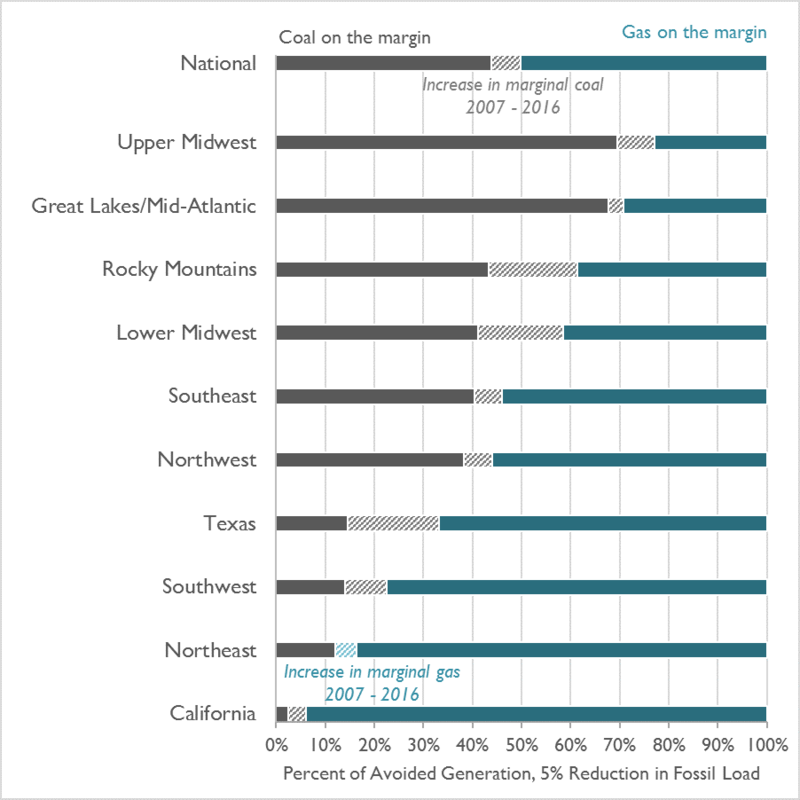 Historically, natural gas has been more expensive than coal and therefore natural gas-fired units have made up the majority of marginal generation. However, a decline in gas prices due to fracking and other factors has changed these pricing patterns. In a world with abundant and cheap natural gas, has coal become a marginal fuel? And if so, what does this mean for emissions from the fossil fleet? Synapse used AVERT data to study the increase in the marginality of coal over the past decade. Our results demonstrate a substantial increase in avoided, or marginal, generation from coal from 2007 to 2016. Nationally, we see avoided coal generation increase from 44 percent in 2007 to 50 percent in 2017, bringing it on par with natural gas. These results undeniably show that decreases in coal generation follow increases in marginality and that marginal generation displaced by energy efficiency initiatives is increasingly coal-fired. We found similar trends across the ten AVERT regions (see figure above). Avoided coal generation increased in all regions but the Northeast, which saw over 950 MW of coal retirements over the past decade. The number of regions where coal accounts for more than 50 percent of avoided generation doubled over this period. Notably, the increase in marginal coal is not due to an increase in coal generation—total generation from coal remained stable or decreased across all regions during this period. Our analysis also confirmed a common assumption: that, rather than simply running less during the same set of hours, coal plants have transitioned away from the “baseload” operations for which they were originally designed. As they become less competitive compared to the energy market at large, coal units first shift to function as load-following units and then to operate as peaking units prior to eventual retirement. This trend is demonstrated for one typical coal unit—Unit 4 of the W.H. Sammis plant in Stratton, OH—in the chart below. 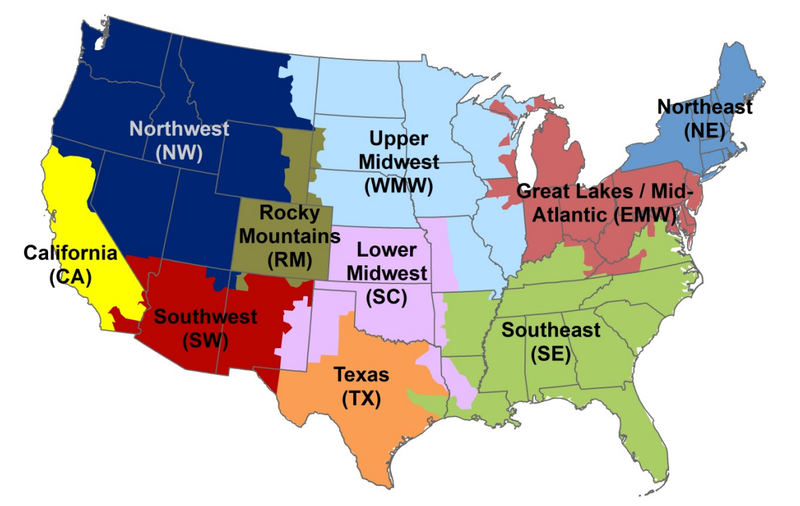 The AVERT Statistical Module takes actual hourly data from each fossil unit in the continental United States and processes this information into a statistical representation of each unit’s behavior at different levels of regional demand for fossil energy. These statistical representations—called “probability distribution functions”—indicate the most likely level of generation and emissions from each unit at any given level of demand for fossil energy. The chart below shows the probability distribution functions for generation output at Sammis 4 for each of three years: 2007, 2012, and 2016. Each point represents a discrete prediction for Sammis 4’s generation level in each year given a certain amount of fossil load. Using 2007 data, the AVERT model would predict that Sammis 4 would run at a high level as long as demand for fossil energy in the region was above roughly 30 percent of its annual maximum—in other words, that the unit would be operating as baseload. 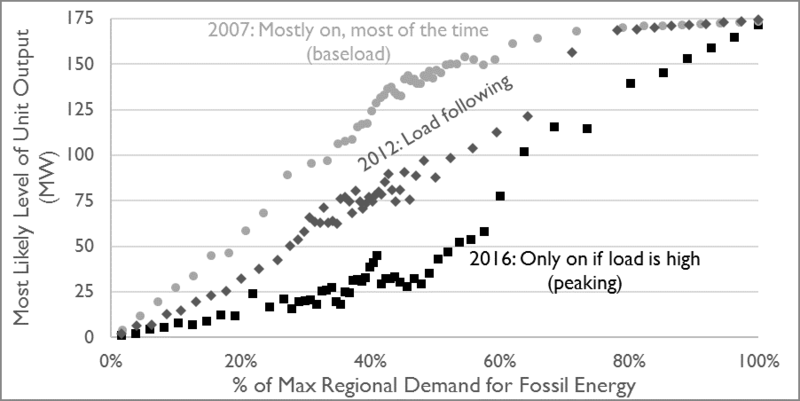 For 2012 data, the statistical representation of the unit in AVERT shows the unit with a load-following operational pattern, with its most-likely level of generation increasing steadily as demand for fossil energy increased. With 2016 data, however, the unit is predicted to operate as a peaker: AVERT predicts that the unit will have high output only when demand for fossil energy is above 70 percent of the annual peak. Sammis 4 is slated to retire in 2020. In addition to looking at dispatch patterns, we measured the impact of the increased marginality of coal-fired generation on the emissions avoided by energy efficiency. We found that, despite the shift in fuel type composition of units on the margin, the rate at which carbon dioxide (CO2) is avoided by energy efficiency has stayed approximately constant over the past decade. In other words, one megawatt-hour (MWh) of energy efficiency avoids about as much CO2 now as it did in 2007. 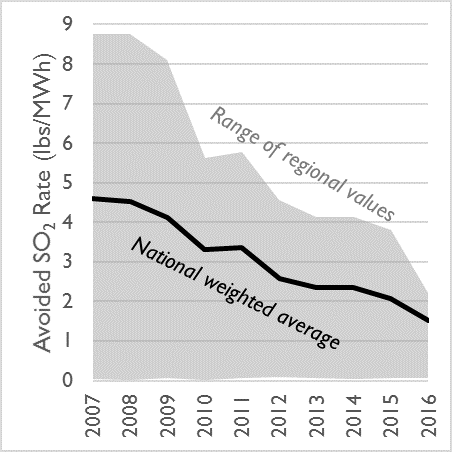 The rate of avoided sulfur dioxide (SO2), however, has fallen substantially over the same time period—from 8.7 lbs/MWh in 2007 to only 1.5 lbs/MWh in 2016. 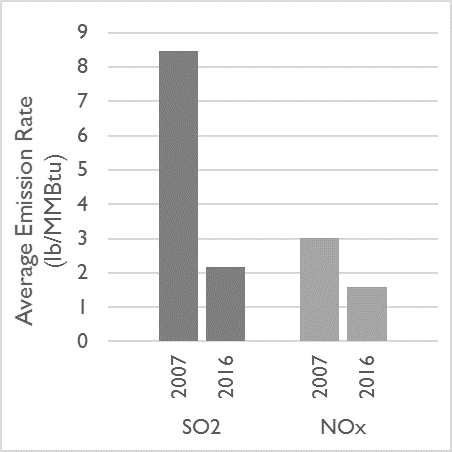 The rate of avoided nitrogen oxides (NOx) also fell over the past decade, from 1.98 lbs/MWh to 1.16 lbs/MWh in 2016. Avoided carbon emissions have stayed basically stable, because increases in the efficiency of the fossil fleet have been offset by the increasing marginality of coal-fired generation. Coal is approximately twice as carbon-intensive as gas-fired generation. 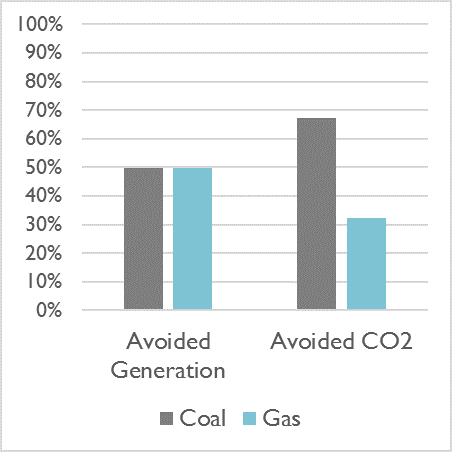 Therefore, coal-fired units account for roughly two-thirds of avoided carbon emissions in 2016 even though they represented about half of total avoided generation. Meanwhile, a number of important environmental regulations—including ozone rules and the Mercury and Air Toxics Standard—have been strengthened or have come into force over the past decade. In 2007, coal-fired generation was approximately 14 times more nitrogen-intensive and over 1,250 times more sulfur-intensive than gas generation. 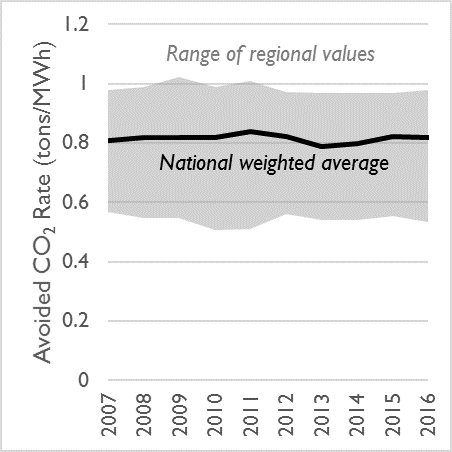 However, one of the impacts of recent regulatory changes has been substantial improvements in the average emissions rate of hazardous pollutants, including NOx and SO2, across the nation’s coal fleet. As a result, avoided emissions from the fossil fleet as a whole have fallen even as coal units have become more marginal.